A while ago, I bought the book “The Go Programming Language” written by Alan Donovan and Brian Kernighan. I have always been a fan of Brian Kernighan’s writings. I should admit that I bought the book mainly for his great examples and writings than for the Go language itself, but since then have got interested in the Go Language, after starting to read the book. Perhaps every programmer knows Brian Kernighan as the “K” in the famous K&R book. He has also written a bunch of other great books, most of them are on my shelf, including some which are out of print. My other favourites are “Software tools” book and the “AWK programming language” book. Brian is also the “K” in “AWK” language. Sure enough, the book does not disappoint at all. The way the language features are described and the “story” developed is something every programming language book author could try to emulate. One of the features of Prof. Kernighan’s books is that the first chapter is a tour of the language features and gives a good taste of the syntax of the language, leaving the readers with enough knowledge to mess around with the language and start writing complete programs. The thing that stood out the most in my eyes was the outstanding quality of the type setting. Everything seemed just right. Some (or most?) readers take typesetting of the programming books very seriously. There is this joke of Donald Knuth taking a break from the TAOCP book project to “invent” the TeX typesetting system. One of the early goofups in typesetting is also incidentally in the K&R Book, written by Brian Kernighan, brought to my attention by my friend and colleague, Olve Maudal. 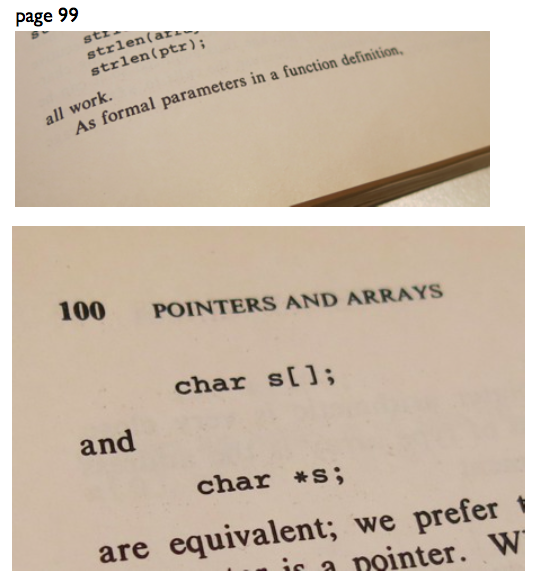 A number of readers of the K&R C 2nd edition book believed that pointers and arrays are the same, due to the non-optimal pagination. how you type set the book? I see the tools used in the copyright page. The reply came a few hours later on the same day. Reproduced here with permission from Prof. Kernighan. characters where you want them. nuisance when writing but the error checking was very helpful. where we rewrote text to hide that fact. The drawings are all Alan's work, using Google's drawing program. job, and it would not have worked with HTML without a lot of work. a complicated makefile to keep it running. The last sentence certainly holds true for just about any project, as far as my experience goes. a complicated makefile to keep it running." In a subsequent email, Prof. Kernighan added that the problem with Unicode was not much of an input problem and was because of troubles getting suitable fonts for actual printing.